What is it about inflation that brings out only absolute black or white opinions? Depending on who you talk to, we're either about to suffer from rampant hyperinflation — or there's no reason to worry about it at all. It is one extreme or the other, without real details. The conclusion is all you'll hear about. The odds of hyperinflation are greater than before the Federal Reserve introduced its quantitative easing programs. With a stable and globally dominant economy, chances of the dollar becoming truly worthless are very low. At the same time — with the unprecedented economic experiment that is QE pumping $85 billion into the market every month — we're adding a massive amount of dollars into an economy that is growing nowhere near as quickly as the monetary base. There is a disconnect here that investors should be aware of. Anyone getting their information from the news or mainstream media is missing the real story. If you could just get around the partisan opinions of biased talking heads and economists, you could make your own decisions about inflationary risk. To start, we need to ask: Which inflation rate are we even talking about here? The first step to understanding inflationary risks is to get a firm grasp of what inflation truly is. It is not just rising prices, although that is certainly part of it. To have inflation, you must have an excess of money supply. The existence of excess money won't mean much on its own if it isn't doing anything; the currency must be circulating in the economy, chasing overall prices that are getting increasingly higher. It is for this reason food and energy costs are often removed from inflation rate calculations: It is all too easy to have a seasonal shortage or disruption skew the numbers. Instead, a wide basket of relatively stable goods and services are tracked over time. When weighted and averaged together using a formula, we can arrive at an inflation rate. When you use a different list of products and services with different formulas, you get different types of inflation rates. The most commonly used measure is a weighted index of goods and services called the Consumer Price Index for Urban Wage Earners and Clerical Workers, or CPI-W. This is what Social Security uses to calculate benefit increases, even though there is a CPI-E for the elderly. It is similar to polls where a thousand people will be robo-called, and the results of the survey are used to reflect the entire U.S. population. Except the polling isn't random at all. And by picking and choosing which goods and services are included — and then tweaking the inflation equation — it is incredibly easy to sculpt the results. The equations used to calculate inflation are complex, but it is only an estimate. The official version is just one of many methods that could be used. Simply swapping the current equation for one used by our government up until the last couple decades dramatically changes the picture. There is talk about changing how the official inflation is measured yet again. Instead of a consumer price index (CPI) based on urban wage earners, we'd be using chained CPI. The reason politicians want to switch between CPIs is to reduce Social Security payouts by reducing the cost-of-living payment increases tied to inflation. 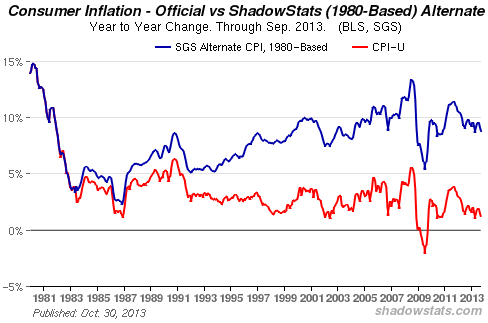 Chained CPI will consistently give lower rates of inflation. Add that up over years, and we're looking at a reduction of benefits in the billions. If the government used the most accurate version of CPI for elderly Americans (CPI-E), it would have to pay quite a bit more to Social Security recipients than it does currently. So there you have it: self-serving manipulation, regardless of intent. It shows how subjective official inflation statistics really are. The Fed has gotten itself in such a mess that tools and tricks to combat inflation are gone. It has no capacity to tighten the monetary supply, decrease the use of credit or increase the Fed funds rate in the next several years. 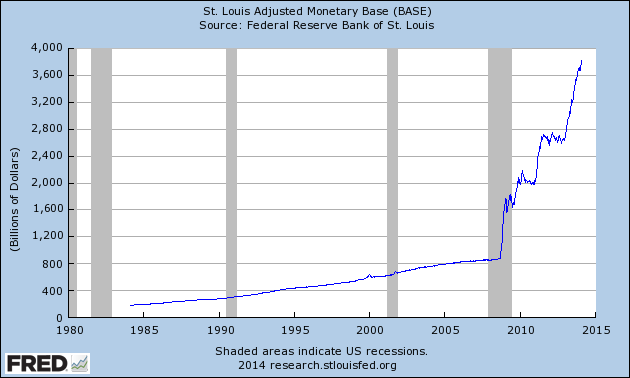 However, the Fed can reduce inflation simply by tightening the monetary base. The concept is simple: Reduce the number of dollars floating around, and they become more valuable. Rising prices are offset by a stronger U.S. dollar. But the problem with our monetary base right now is that it is still expanding very quickly while we have yet to even see the inflationary effect from the Fed's QE programs. We're in an uneasy and weak economic climate, while international banking rules are being rewritten through the Basel III meetings. This creates an environment where there is a lot of concern about low profits from riskier loans with low yields. A whole lot of money is staying out of circulation because of it. If the recovery picks up steam, and banks are more confident in their ability to create profits, that will change far quicker than the Fed can react. On a related note, the Fed can reduce inflation by changing the reserve requirements from banks (these figures are included in the total monetary base chart above). Banks would have to soak up more money to meet higher capital requirements and pull money out of circulation. However, banks are already chafing under new reserve requirements after the meltdown and following the recession. 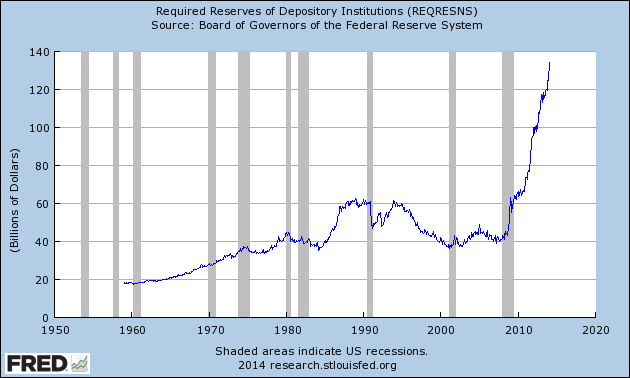 From what we see in this chart, required reserves are already going up as quickly as possible. The Fed cannot increase reserve requirements any faster to curb inflation. The Fed has a bit more leeway with the Fed funds rate, or the interest rate banks charge each other for loans to maintain their reserve requirements. Banks use these short-term loans to shore up reserves as they loan money to businesses. 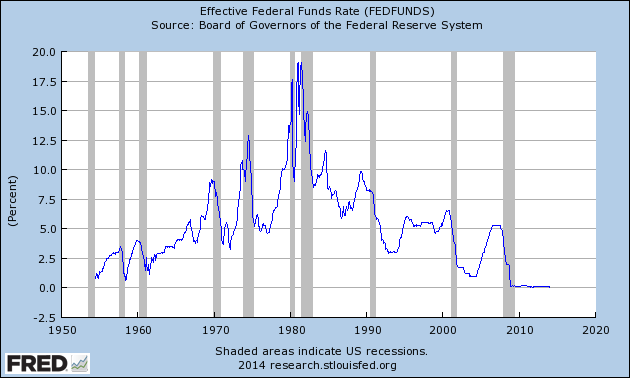 Raising the funds rate discourages this by raising the cost to banks and eroding their profit potential. Thus, the circulation of money slows. The Fed would have to start a recession to fight inflation, which it would never do. Finally, we have the discount rate, the interest rate charged to borrow money for reserves directly from the Fed. This is like the funds rate in all regards — except the source of the capital: It has been pegged just above 0% to spur economic activity for the last several years. The choice is recession or fighting inflation once again. The Fed has put us on the ropes. We're not down for the count yet, but we have no way to defend ourselves if the punches start flying again. In spite of the evidence to the contrary and the risks the Fed has taken to date, headlines about inflation continue to follow Ben's lead. Ben's successor, Janet Yellen, is following his play book to the letter as well. For your own sake, don't let the Fed, Yellen and her standard bearers sway you with their self-serving agenda. In my opinion, a healthy dose of fear is a good thing in our situation. It will give investors pause and make them consider the long-term implications of our distorted economy on their investments, which should prompt them to keep contingencies in place to protect themselves. Just about anything that isn't solely valued using a single currency, such as bonds or shares listed through U.S. exchanges, can be an integral part of that contingency plan. Popular options are gold, silver, real estate and just about anything that isn't bought, sold, and exclusively derives its value from a single currency. We certainly don't think you should completely shun the dollar and sell off stocks or bonds you own now. There is plenty of opportunity for gains and profits from innovative and dynamic American businesses right now. Many of these companies either sell commodities, products or services on a global scale, thus limiting their exposure to the inflation rate of any single currency. Ultimately, diversity is the key to limit the long-term vulnerability of your investments. Nothing else can match gold's inflationary hedge and equity insurance properties. However, even less obvious choices — such as luxury goods that appreciate in value over time — have worked exceedingly well over the last ten years. Funds designed to pool money to buy art and wine are increasingly popular choices. With markets in Europe and massive demand in Asia, they are uniquely positioned to maximize returns for luxury goods using virtually any major currency around in the world. The Outsider Club will continue to cut through the propaganda and biased perspectives to give you the highest quality financial research available today.